During the Book Fair of 2017 in Antwerp, we presented Jan Bosschaerts monography for the first time: 'The best of Jan Bosschaert'. During the fair, visitors could get a real tattoo by a tattoo artist. The designs were all made by artists/authors who were present with one of their works at the fair. Jan Bosschaert also submitted a design: a drawing of a female devil called the 'duivelinneke'. The 'duivelinneke' turned out to be the most popular design of the fair and was tattooed several times. To commemorate these circumstances, Stockmans is designing a limited edition of the monography with the 'duivelinneke'. 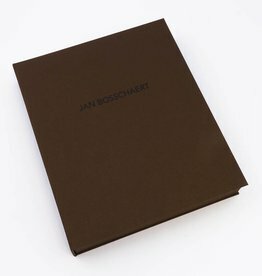 The book 'The best of Jan Bosschaert' will be wrapped in a luxurous cover of real leather. The leather will be tattooed with the 'duivelinneke'. More information on the price and number of copies will follow. To be continued! Kwalitatieve kunstboeken van internationale kunstenaars.